Where Opportunity Knox, a regional initiative to connect transitioning Veterans and/or military spouses to jobs and the Greater Louisville Region, continues to connect Veteran talent to employers in our region, now through focused efforts to bring Veteran talent to the employer’s doorstep through employer showcases and fellowships. One of these programs is the Senior Leaders Corporate Fellowship Program (SLCF), an eight-week program launched in February 2017. 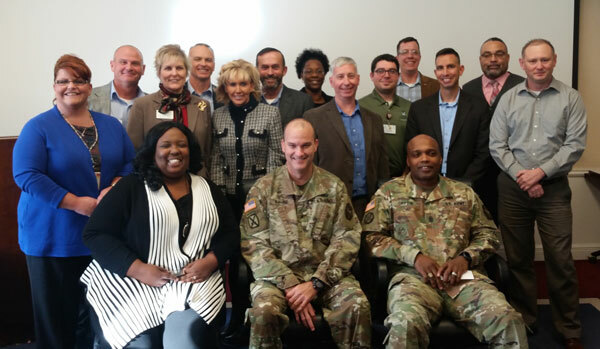 Where Opportunity Knox’s fourth cohort of the Senior Leaders Corporate Fellowship Program (SLCF) graduated on Friday, December 8th in a ceremony held at the Fort Knox Garrison Command Headquarters. Congratulations to CPT Raul Rodriguez who worked at Brown-Forman; MSG Anthony Whelan at Family Scholar House; SFC James Terrell and LTC Kim Cheney at GE Appliances; LTC Timon Groves and CW4 Roger Wheatley at Trilogy Health Services; and SFC Latarsha Isom at UPS. To date, twenty Fellows have graduated from the program in the first four cohorts. Quarterly cohorts are planned for 2018 and Where Opportunity Knox is actively recruiting other companies to participate. As part of the Senior Leaders Corporate Fellowship Program, senior military leaders, in the final stages of their transition to a civilian career, have the opportunity to spend four days a week working in a regional business where they work on projects, shadow business leaders and experience the civilian workplace. Each Fellow also receives weekly classroom training on Mondays at Fort Knox to learn about resume writing, interview skills, using social media in a job search, etc. The Senior Leaders Corporate Fellowship Program has proven to be an impactful way for transitioning military personnel to get a firsthand understanding of what it's like to work at some of our region's great companies. Where Opportunity Knox’s Veteran clients have the opportunity to work side by side with a company’s employees for eight weeks to experience what it's like to be part of the civilian workforce. And Participating Employers have the opportunity to connect with some outstanding Veteran talent. A win-win! Where Opportunity Knox is funded through the generous support of the Cumberlands Workforce Development Area, the Duke Energy Foundation, the Gheens Foundation, the James Graham Brown Foundation, the Lincoln Trail Workforce Development Board, and the Ogle Foundation.